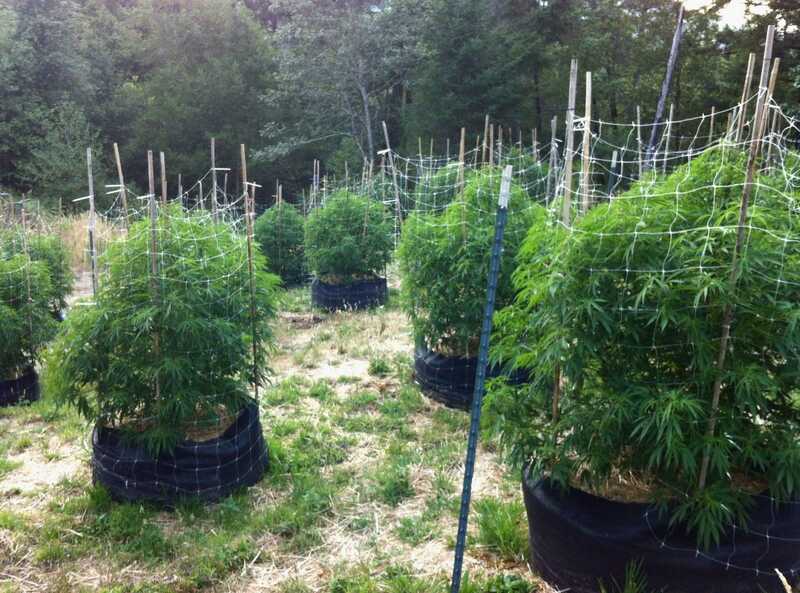 If you are trying to make the most of mother natures free resources then you need to find out how to grow marijuana outdoors in this section. This simple guide covers all you need to know if you are looking to get setup for an outdoors grow. The general consensus appears to be that growing marijuana outdoors is the cheapest option and produces a much larger and higher yielding plant with better tasting smoke, therefore making it a more preferable method to growing marijuana indoors. The major advantage is sunlight. Using natural sunlight will mean no electricity bills or grow light and hydroponic gear costs. Probably more importantly, the sun produces more light than thousands of metal halides in one grow room could ever provide and so direct sunlight hits more of the plant than grow room lights can (no more light leaking problems as is the case with indoor growing). This results in much larger, higher yielding plants where the bottom of the plant is almost as developed as the top (unlike indoor marijuana plants). Of course, there are also disadvantages that come with growing outdoors. Ensuring plants remain undetected (from the law and from others who want to steal it and use it for themselves) is probably the primarly concern and hence finding a suitable location can be difficult. Outdoor plants are also vulnerable to wild animals and pests like deer, rodents and bugs. The environment itself can also cause damage when there are heavy winds or rain. This is obviously the single most important factor. A site should be selected based on the likelihood of it being stumbled upon by people so this means make sure your sites are located well away from roads, trails, railroad tracks, power lines and generally any other man-made structure. You should try and find somewhere with features that are likely to deter people like mud, water, prickler bushes and steep hills. Also remember that many plants turn brown in the fall and so growing marijuana outdoors near plants that will remain green, such as pine trees, will provide some form of camouflage during this season. If there are hunters in the area, find out when and where they roam. Marijuana plants also grow well in corn and this will help with camouflage. It does not grow well with rye, spinach or pepperweed. People tend to notice patterns so it makes sense to plant in many small, broken patches. 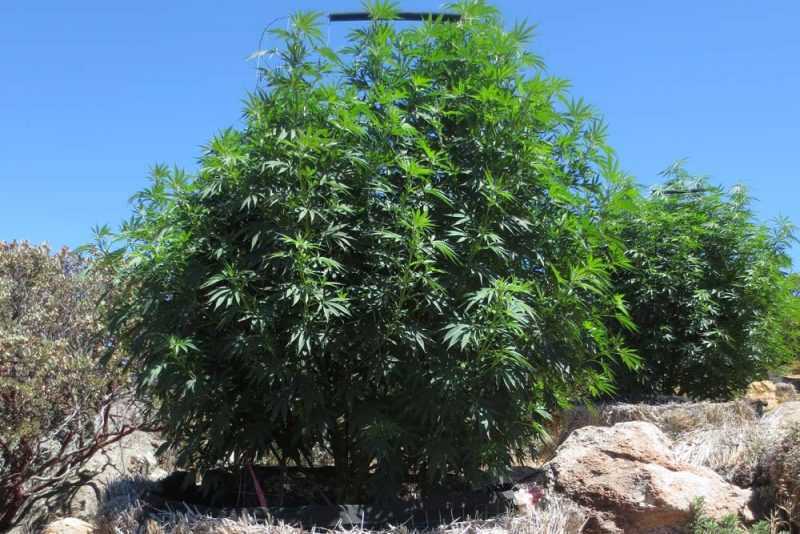 For best results, marijuana plants should be placed in a position where they receive the maximum amount of sunlight. Ideally they should be in a place where they receive at least 8 hours of sunlight a day of which a minimum of 3 hours should be direct sunlight. The more sunlight, the faster and bigger the plants will grow and the yield will be maximised. This may be difficult when you factor in ensuring the place is secluded, so if finding somewhere with enough light is an issue, choose somewhere with the most exposure to morning light than afternoon light as marijuana plants respond better to morning light. Tin foil placed around plants to increase light reflecting onto leaves will also make a large difference where direct sunlight is less than 3 hours a day. There are a number of factors that make up the ideal soil composition. Probably the most important factor is to ensure the soil drains well. A good test is to ensure the soil compacts when you squeeze it and will break apart easily when poked. If you must plant in poorly draining soil, its a good idea to add sand, perlite or vermiculite to the soil to improve drainage. Optimum soil pH is 6.5. The plant’s ability to absorb nutrients effectively decreases with a pH higher than 6.5. Conversely, a pH lower than 6.5 often results in the development of more males than female plants which is undesired. The addition of hydrated lime to low pH soil can help raise the pH. As lime is slow releasing, its best to add it during the fall or at least one month prior to planting to ensure enough time to raise the pH. If you want to lower the pH of the soil, you can add sodium bicarbonate. Where the water table is high, soil will remain very wet and plant roots don’t receive enough oxygen and die. If this is the case, it would be better to grow in pots with an inch layer of gravel on the bottom for good drainage and the rest filled with potting soil. The larger the pots the better as this will mean less restriction of roots and therefore bigger plants. Where the water table is very low, the soil will dry out too quickly and you will therefore have to water the plants very often. If this is the case you should pay close attention to the information under Water Supply as this will be of great significance to you. The most ideal situation would be to have a fresh water supply nearby. Water is very heavy and the further away the water the harder the work. Buckets should be kept nearby to carry water to your site. If no water supply is near, buckets or large barrels (partially buried) can be left to collect rainwater. If water must be brought into your site, it should be done at night and watered the next morning. You should avoid watering in the evening or late at night as this increases the possibility of developing problems with mould. Another alternative is to find locate close to water supply in high mountains at altitude and route it down to a lower level drip system via a hose to water plants continuously. Small holes can be punched into a 5 gallon gas can with a hose run out and secured to the main opening. The can can be buried in a river or stream under rocks (hidden and submerged) and the hose coming out of it buried and run down the hill to your site. You should pay some consideration to the wild animals or pests you will encounter in your area when growing marijuana outdoors. Wild animals tend to eat young marijuana plants. To avoid this, hair from predator animals such as bears, lions, foxes and wolves can act as a deterrent. To keep out deer, a fence can be created from fishing line hung at 8 inches and 3 feet off the ground. When plants are small, a drinking glass can be placed over them which keeps out rodents and deer and also acts as a humidity tent.